Let your dog jump, splash, swim, and play at Splash Your Pup! Splash Your Pup is an indoor dog swimming pool and we offer private classes, certified trainers, dock jumping decks, and more! Dogs love to swim, but living in the midwest we only have a few months where our best friends can enjoy the swimming pools. That's where we differ! Our pool is indoor and offers swimming all year long! We're nationally recognized and we're owned & operated by certified dog training specialists. Our indoor pool offers your dog with ramps and diving platforms that are designed to help provide your pet with a safe place to practice diving, casually exercise, receive professional training from our certified staff, or just splash, play and have fun! We have the highest quality ozone filtration system available, and we combine that with our safe and non-toxic minerals to ensure that your best friend is safe and sanitary in our pool. We pride ourselves in keeping our pools clean of harsh chemicals. Our members can enjoy private swimming sessions, one-on-one training, group swimming, and so much more! What Are The Benefits Of Dog Swimming? You might be asking yourself "why should I bring my dog to an indoor pool?" You're not alone. Dog swimming and dock diving is not only an activity that is fun for you and your dog, but it also helps to keep your dog healthy and in shape providing many great health benefits. The stronger the muscles the more resist a dog will be to injuries sustained during typical exercise. Swimming can help with rehabilitation from various forms of injuries. Be prepared to get wet --it is highly recommended you bring an extra pair of shoes, wear quick dry clothing or a change of clothes. You can bring your own floatable toys. There are training aids available for purchase. Hard copy of vaccines. We require Rabies, Distemper, titers are allowed. No exceptions- if you forget vaccine paperwork you will not be allowed to swim and will be charged a late cancellation fee of $50. Your vaccine paperwork will be kept on file and will be expected to update on due dates. A drying station is available after swim and towels are provided. Children on the deck must listen to instructions and not present a safety risk. Splash Your Pup staff may ask children to leave deck area if there is a safety risk to the dog or children. No one under 18 is allowed on the dock without a parent or guardian present. 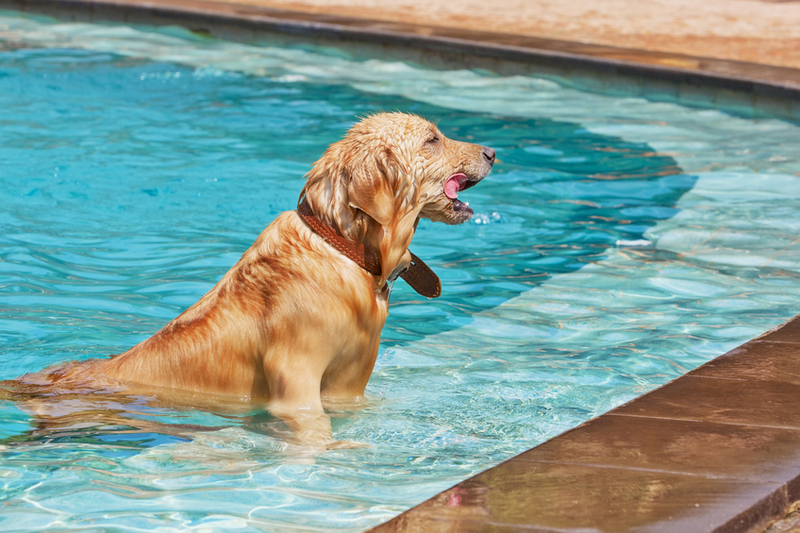 Contact us to learn more about our pool and how you and your dog can benefit! Or just stop on by our location, we'd love to see you and say hello!